Awesome hands-on play with an early learning math and LEGO sensory bin! 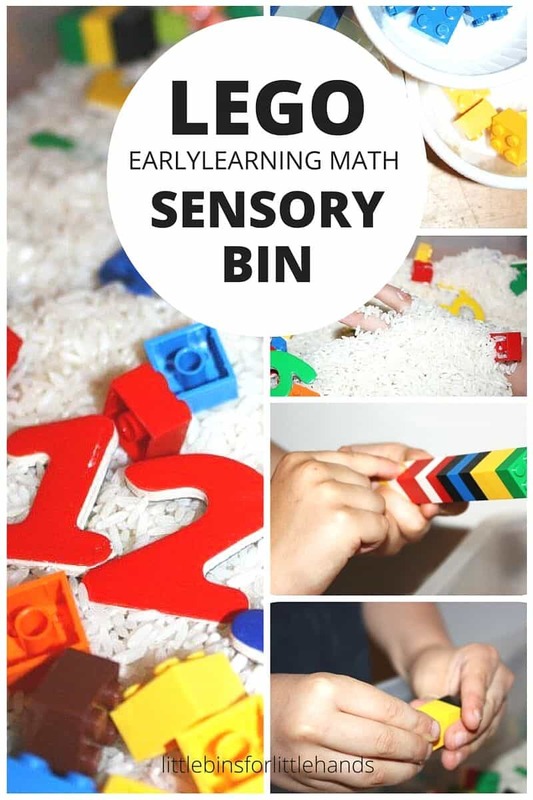 Sensory bins are an awesome tool for early childhood education because they are so playful but you can encourage so many learning opportunities from early literacy, fine motor skills, to math and even science skills! 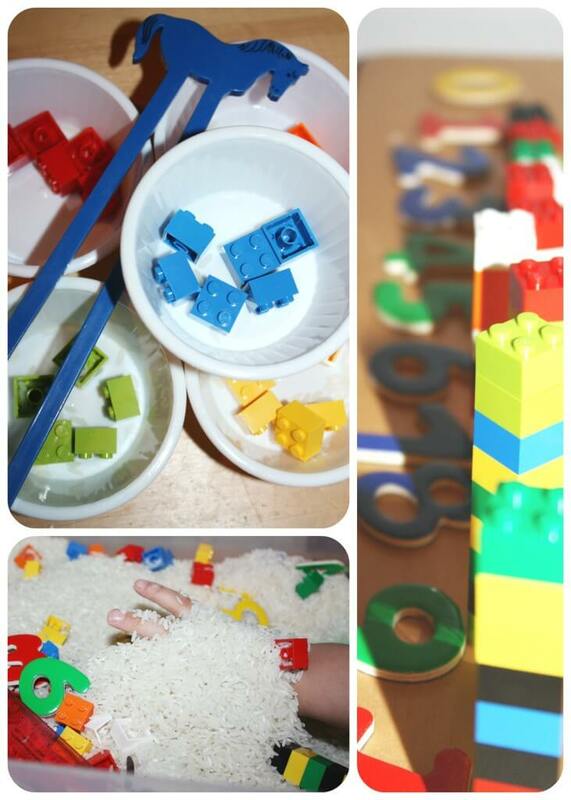 Plus we love creative LEGO activities for kids. EARLY LEARNING MATH AND LEGO: Play and Learn! This is a very simple activity to set up! We love sensory bins because of all the wonderful benefits they offer young kids! Tactile play is very engaging for young kids and it is a great way to mix in early learning skills like we have done here with this LEGO math bin! The LEGO bricks, number magnets and chopsticks were all we needed to make up some fun math games. My son always enjoys our homemade math games and really enjoys the sensory bin math games! Sorting Colors: Provide small containers and have child use chopsticks to sort the colors. Make them into towers and measure with ruler (I did not count out each color before putting in bin). Patterning: Make a pattern and have your child copy it. My son has learned patterning, so we took turns making a pattern to copy. Also check out our Dr. Seuss patterning LEGO activity! 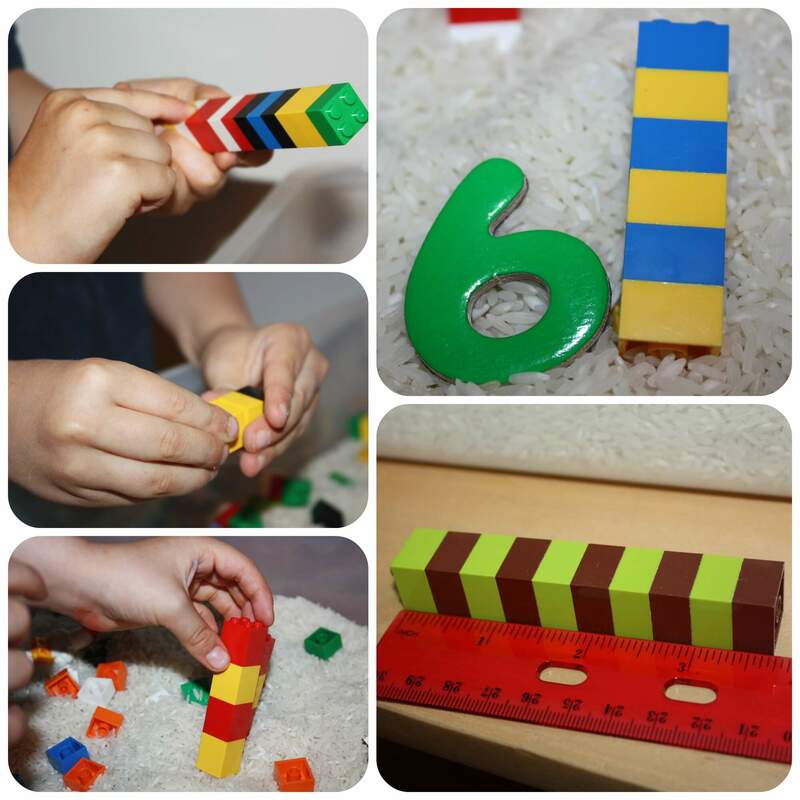 Number Towers: Build towers from 1-20 and find the correct number. Build a mystery tower and have your child count and make the number! Tallest Tower Race: Try to make the tallest tower. (for time or till it falls) Count who has the most bricks. Building Challenge: What can you build in 2 minutes? How many bricks did it take? Measure Towers: We are learning about rulers and how to measure this week. Make a dice game: We rolled two dice for 20 turns and then counted who had the most. Of course the bricks can be made into towers and measured! Number Recognition: Find the numbers and put in order! Can you do it backwards. What comes before? Of Course it was fun to just dig into the sensory bin! Check Out Our Early Learning Math and LEGO fun! Sometimes a simple sensory bin can be very helpful for engaging a child while working on specific skills like these alphabet sensory bins. A sensory bin, goes beyond the initial activity and allows the child to explore and discover in new ways! More than worksheets, sensory bins off a rich learning experience while including necessary skills. This lego sensory bin was so easy to make and share with my son. It can truly make learning an exciting experience. Take a look at your LEGO today and work on early learning math skills too! Oh, I love all your academic ideas! Legos can be used in so many ways!! And here as a kid all I did was build with them! I love this! 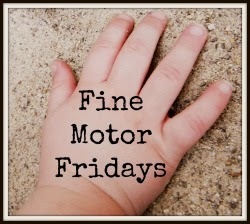 This activity is so fun and versatile!! I love all of the different learning aspects! We LOVE math activities around here, too ; ) Looks like a super easy bin to set up– bonus! This bins are just so great! I love being able to pull together activities from simple items around the house!